You are not just an EA professional, you are also a marketing director. This means you have to sell your services, not just tell people what they are. Do this marketing work effectively and you will create emotion in your audience and they will pick up the phone more often to call for help. 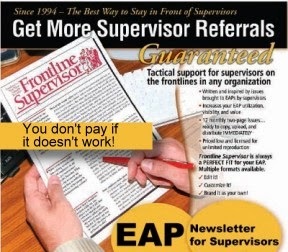 In emails, brochure, or other communications talk about "promises" of the EAP. It is a great way to help your mind and language in written communication shift to "benefits" rather than features of your services. This is what "hooks" your EAP client. For example, if an employee comes to your office for help with a financial problems or debt crisis, what are the promises for getting that problem resolved? Sleeping better, less fear, worrying less, and a more hopeful future of course. Employees with financial problems think more about the loss of these things than debt. Speaking of debt problems and employee assistance programs, consider more outreach in this area if you are not doing so now. People use a lot of denial and magical thinking to deal wit their financial problems. A recent MetLife Study of Employee Benefits Trends discovered that about 44% of employees live paycheck to paycheck, and nearly 60% are very concerned about having enough money to make ends meet. Most people would agree that financial stress is difficult with its accompanying worry and distraction, but this is only part of the story. Many people endure financial stress alone because of stigma, fear of being judged by others, or feeling guilty because of overspending. These issues can keep employees from seeking help, even from the most trusted EAP. Financial stress can contribute to headaches, backaches, ulcers, increased blood pressure, depression, anxiety, and panic. Many employees will cope with financial stress using denial, magical thinking, and or coping strategies that relieve fear, but don’t solve their problems. As problems worsen, risk increases for falling prey to payday loans, internet schemes, gambling, or other high risk remedies. Financial problems diminish one’s sense of autonomy, feelings of security, and self-control. 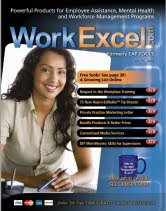 So with financial problems come increased workplace absenteeism, diminished workplace performance, and depression. All of these things can adversely affect productivity. 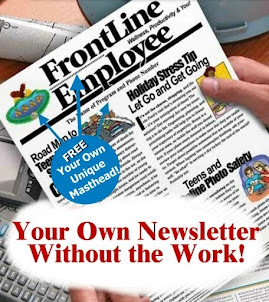 Print this form and fax it to get a free trial to FrontLine Supervisor Newsletter to get more good stuff like this and drive more referrals to your program. Print this brochure and fax it. Just mark on it "Dan, just give me a free trial. Don't bill me."